The iPhone is getting a lot of use. what did you do editing wise ? The apps I use most are Camera+ for taking photos, Snapseed for tuning the image and for HDR, and Waterlogue for creating the watercolour effect. 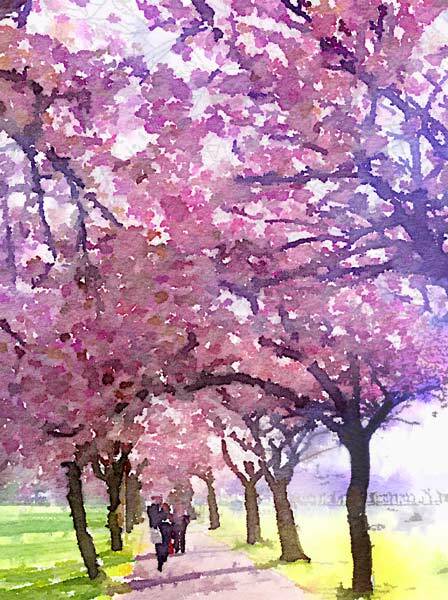 I took the photo of the cherry blossom with the Camera+ app and then ran it through Waterlogue. I have the Pro HDR app as well. It takes two photos sequentially with different exposures and then blends them. And for some subjects it works well. Here’s a shot of a window in a museum that I took with it. This Spring ‘painting’ is quite lovely! I wish they’d plant cherry trees in our square here too.